In a large bowl combine beef, apricots, pine nuts, cilantro, garlic, salt, cumin, cinnamon, coriander, and pepper. Shape mixture into four 3/4-inch-thick patties. For a charcoal grill, grill patties on the rack of an uncovered grill directly over medium coals for 14 to 18 minutes or until done (160 degrees F), turning once halfway through grilling. (For a gas grill, preheat grill. Reduce heat to medium. Place patties on grill rack over heat. Cover; grill as above.) 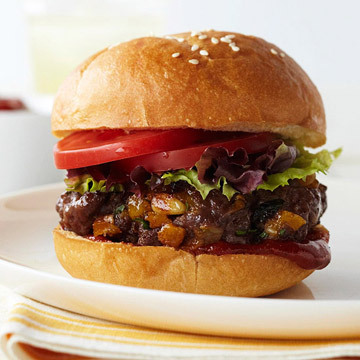 Serve burgers on rolls topped with Moroccan Ketchup, lettuce, and tomatoes. Makes 4 servings. In a small bowl combine ketchup, ground cumin, ground cinnamon, ground coriander, and round black pepper.